Thyme essential oil by Nature's Kiss has a strongly herbal, yet sweet fragrance. Thyme Red Essential Oil 10ml - 100% Pure Description: A small evergreen shrub reaching approximately 20 cm high with small grayish-green oval leaves and tiny purple flowers. It is indigenous to Spain and Italy, but cultivated in most countries with temperate climates. The crude distillate of Thymus vulgaris is Red Thyme. The further distillation of thyme is known as White thyme. Botanical Name: Thymus vulgaris Common Name: Red thyme Plant Part: Leaves Extraction: Steam distillation of the leaves and flowering tops Color: Reddish brown Consistency: Thin Note: Top to middle Strength of Aroma: Strong Blends well with: Bergamot, chamomile, celery, juniper, black pepper, rosemary, myrrh, sage, tea tree, lime, grapefruit and cedarwood. Aromatic Scent: Spicy-herbaceous aroma Cautions: Not indicated in the first and second trimester of pregnancy. 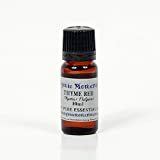 Red thyme is a uterine stimulant and woman should avoid the use of the herb, tincture and essential oil of Red thyme. Use in lower concentrations as it may act as an irritant to some people when undiluted. Externally it can cause skin irritation and is potentially toxic if used excessively. Thyme Red Essential Oil. 10 ml. 100% Pure, Undiluted, Therapeutic Grade. Botanical Name: Thymus Vulgaris Plant Part: Leaves Extraction Method: Steam Distilled Origin: India Common Uses: Red Thyme Essential Oil has been used effectively as a bactericide, antiseptic, antimicrobial, astringent, antispasmodic, antitoxic, diuretic, antifungal, insecticide, tonic, and as an immune stimulant. Thyme Oil can assist with nervous complaints, respiratory problems, poor circulation and problems of the digestive system. It should also be noted that the active ingredient Thymol may crystallize in temperatures below 20 degree Celsius. The more thymol present, the greater it's propensity for altering states. We would recommend placing the bottle in a very hot water bath, changing the water frequently and once it is back to the liquid state be sure to shake before use. Consistency: Thin Note: Middle Strength of Aroma: Medium Aromatic Scent: Red Thyme Essential Oil has a fresh, herbaceous, medicinal scent. It has often been described as sharp and warming. Cautions: Red Thyme Essential Oil should be avoid during pregnancy, or if a history of high blood pressure exists. Red Thyme contains a high amount of toxic phenols (carvacrol and thymol) that can irritate mucus membranes, cause skin irritation and skin sensitization.